📅 January 2016 December 9, 2018 by Bruno B.
Zip lining in Chiang Mai is one of the most popular activities for travellers. 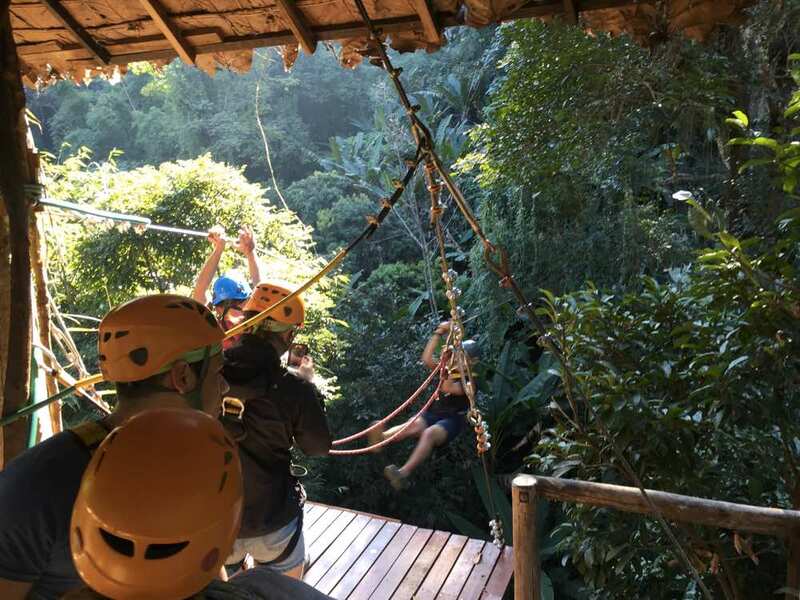 Contrarily to many places where all you get is a go in a single zip line, in Thailand you manage to try a complete course of zip lining through the jungle. That sounded exciting enough to add to my bucket list. 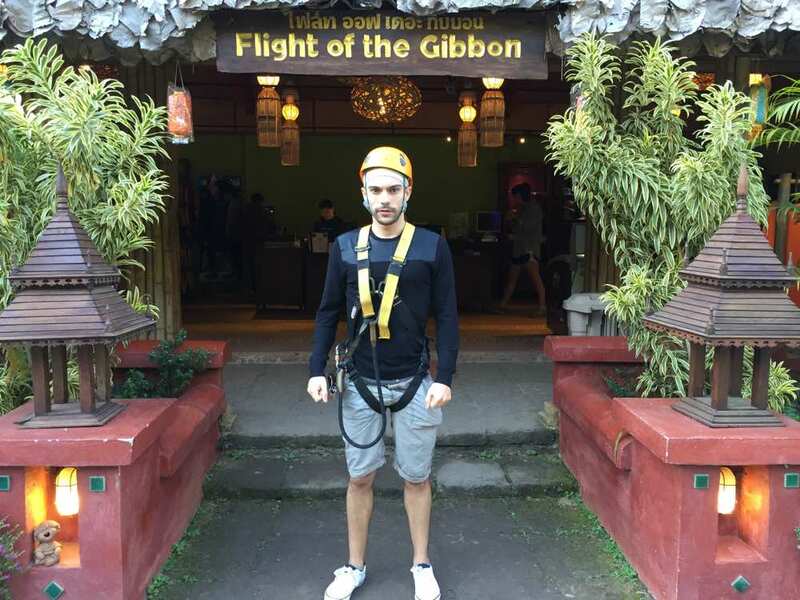 This was my first-time zip lining in Chiang Mai, Thailand! 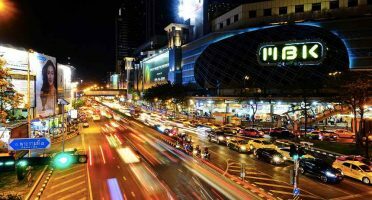 Yes, Thailand is a gem for trying out new experiences. 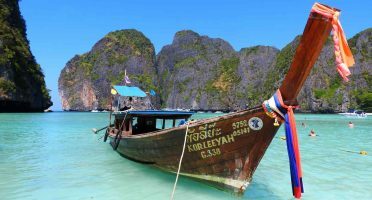 Whether is indulging in delicious food, explore some of its amazing tropical islands or ticking the coolest things off your bucket list in Chiang Mai, you won’t get bored. But one of the goals of my trip to Thailand was to try out different adrenaline-packed activities. Including the ones that I would be reluctant to do. So nothing better than face my inner fears and zip line through 70-meter-high tree tops to feed my vertigo! After doing some research and looked at the different competition, we thought we’d give the heavy weights Flight of the Gibbon a go. Apart from being the zip lining company established longer in Chiang Mai and the prospect to see wild gibbons (! ), they assure to have the higher safety standards. And after reading many disturbing news about tourists getting killed in other similar tours, this seemed important. We decided to play it safe or I could come back with another reason to fund my fear of heights. Or don’t come back at all. We were the first ones to be picked up from our hotel at 6:30 in the morning (with British punctuality) in a comfy air-con van. There were 6 people in total in our group and the journey to the Mae Kampong rainforest took about 1 hour. With retractable seats, for more than half of the way I was admittedly asleep. As soon as we arrived to their office and opened up the door of the van, I was grateful I had brought a warm long-sleeve shirt. 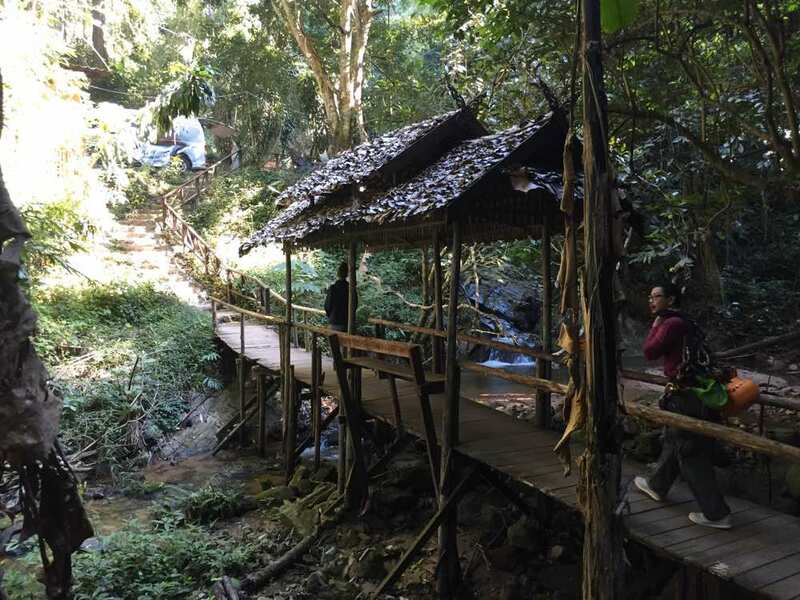 Weather in this rainforest is usually way cooler than Chiang Mai city, so it’s something not to forget, specially if you’re taking the first tour of the day like I did. After a quick welcoming by our guides (they call them Sky Rangers), we were quickly kitted out in the safety gear. Hard not to look ridiculous in any safety gear but that light-blue bandana and the orange helmet were not doing me any good. If we followed these four simple rules, nothing would happen. No dramatic falls over the tree tops, no fingers cut off nor violent landings. Simple enough, right? I’ve got to say I really enjoyed this initial approach. The high concerns for safety are evident – we were told “safety first!” several times – but at the same time they were able to brief us on a light-hearted and fun way. In a way, they transformed a man terrified of heights into someone pumped out to start flying high. Who knew?! Finally we were ready to fly. The course itself was very well-designed by New Zealand and Australian experts. The first two zip lines were just a few meters away from the initiation point and were ideal for starters: not too long nor not too high. Just perfect to get a grasp on how to place your hands, how to balance your feet and most of all, gain confidence for what was ahead. And oh boy, I really needed some confidence! The complete course of Flight Of The Gibbon in Chiang Mai. Other than a few seconds of panic, everything was better than expected. Then, the Superman jump. This one is different: you need to actually jump while you’re only attached to a hook on your back. Nothing to hold on to, completely freestyle! At this point, I had somehow moved my way to the front of the line. Questions kept popping out on my mind: “What should I do with my arms so that I don’t look awkward?! And with my legs? Should I close my eyes?”. I couldn’t see the ground – only a carpet of treetops beneath – and it definitely scared the hell out of me. Eventually I jumped out literally into the green. While the first two seconds were…intense, it was an amazing experience and the biggest adrenaline rush of the day for sure. I may however have produced some indistinctive sounds of a terrified man. We continued to swoop around the forest for two hours. There are 33 stations in total – 5 more under construction, the main guide told me – and I was particularly impressed with its variety. 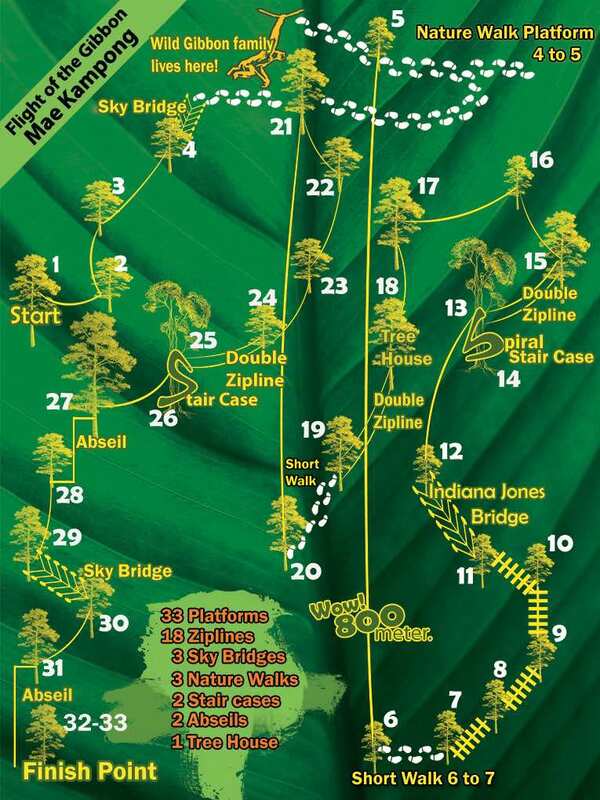 The course has not only straight zipping – including several 100m and 300m-long lines – but we also did tandem zips and crossed suspension bridges in an Indiana Jones style! Overall the transitions between transitions were quick and efficient. I couldn’t help to think the fact our group was only 6 people had a lot to do with it. The waiting periods could become potentially boring with bigger groups. In one of these short walks before stations, we actually could see four gibbons… from a distance. The guides warned us not to get too close because they were “dangerous” which was a bit underwhelming considering the zoom of our cameras were barely enough to get a decent photo of them. I would have enjoyed to learn more about the gibbons itself. As they are present on all their branding, it would have been fair to really get to know the efforts made to preserve the safety and well-being of those extraordinary creatures. Some people asked some questions about them, but to be honest the guides were a bit vague and always changed the focus back to zip lining. I feel little time was dedicated to the gibbons or to the jungle they live in, when this could easily become one of the highlights of the tour! I’ve however appreciated the attempts to educate us about how fragile the jungle ecosystems are becoming – several statistics and insights were shared by the guides along the way. Additionally, the Sky Ranger shared there is an expert from Italy checking the safety and overall health of the trees where the stations are put in. For me these are the kind of details that show if you’re dealing with just a tour company or if they are also honestly concerned about sustainability and the overall footprint of their activity. After The Ride, Time to Relax! We were got taken back to the office where we were offered a traditional Thai lunch. The food was good and the setting really impressed. The restaurant was in a traditional hut, built just by a small river and it had live music played by traditional tribal musicians. Great opportunity to chit-chat and get to know the other people in our group. Finally, the last stop on the tour was a quaint but unimpressive waterfall. We wandered around for a bit before getting back to Chiang Mai by 13:00. I felt proud of myself. Considering I could barely cross a bridge in Porto due to my vertigo, doing a complete zip lining course felt huge! Going back to the van after the thrill! My overall impression of Flight of The Gibbon was very positive. They delivered in all parts of the tour – transportation, briefing, zip lining and lunch – and provided amazing fun to everyone. They also excelled in making everyone comfortable, including the ones afraid of heights like myself. Apart from the fact the sustainability and ecological footprint of the tour were not 100% conveyed for me, I have got only good memories from this day. It was a truly memorable experience for both the nature-lover and the thrill-seeker in me and well worth waking up before 6am for. Whenever you’re around Chiang Mai, add “fly through the jungle” to your bucket list too! No messing around in the treetops, the equipment seems all new and secure. It’s clear this is Flight Of The Gibbon’s top priority. The experience itself is exhilarating! Size and variety of the course. It’s a massive jungle adventure and you’ll be doing many different cool stuff. The jungle is impressively big and surrounded by the Mae Kampong village, with many dwellers who cultivate coffee and tea. Free and absolutely flawless. Two very comfortable rides. The tour is more expensive than the competition. But at the same time it’s great value and safety comes with a price. I’d hoped to learn more about the gibbons and the jungle itself, which would have tied all together nicely. Thanks to Flight of the Gibbon for hosting me on this trip. With so much to do in the city and its surroundings, I also didn’t want to waste time looking for a place to stay. Also, I went during the peak season, so I decided to skip the hassle and book ahead my accommodation. 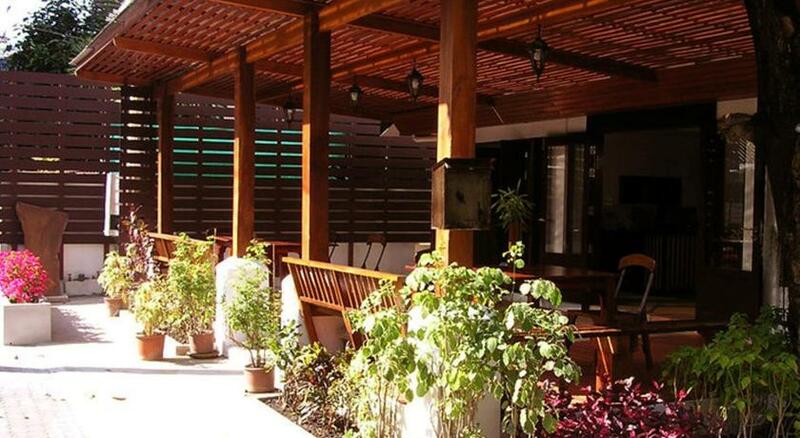 Stylish and charming, this hotel has breakfast included and a salt-water (!) swimming pool. 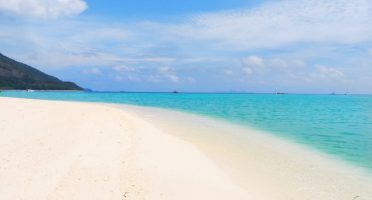 With an excellent location, friendly staff and clean minimal rooms, this guesthouse is suited for the more budget-conscious. 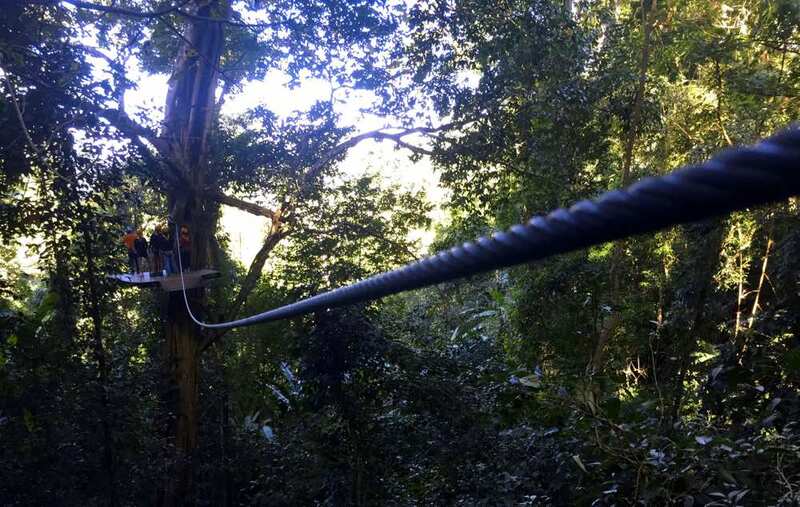 Have you zip-lined before? Where?